HTC Sense Cydget is the first theme can cache weather data. It can improve weather loading speed and provide weather when the network is unavailable. 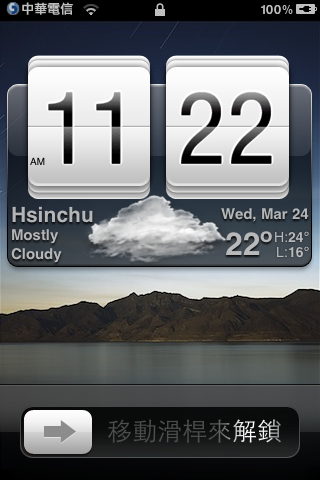 To change the region of weather, edit this file at /System/Library/LockCydgets/HTCSense.cydget/private/configureme.js. If you like HTC Sense Cydget, please donate. 1. How to change the locale in weather section? Go to http://weather.com/ and enter your location to find it. 2. Where and how can I edit the configuration? Due to new config item was added in config file, disable config restore mechanism while upgrade to this version. download iphone browser and navigate to the file path shown in cydia, download the file and edit the file in notepad, then save it back to your phone. how can users edit the background. Please goto settings and change your background. Yes. You only need to type "HTC Sense Cydget" in cydia, and after install you need to modify configureMe.js. How do I change from Celsius to Fahrenheit? The weather source i'm using is Yahooweather…. it will not update…?? Please check your locale. Find your locale string in weather.com. Is there anyway to change to source of the weather forecasts from say Yahooweather to something else? Good cydget.thx. When is the 1.1.2 gonna release? Can't wait for it. Hi, I found my place at weather.com but what I cannot find is that locale code. Could you please giv some advice? For everybody: look into the adress line in your browser! Where's the download link, dude? This is cause by Cydget, not this cydget. Because Cydget use double click home button to switch between cydgets. changed isCeisius = false but the screen is blank. original setting is “isCeisius = truevar” tried falsevar and didn’t work. Pardon my ignorance, but I can’t seem to get the locale working. Can you please provide an example? On further investigation, it would appear that I have the correct locale, but the data is not being updated. After modifying the configureme file, I rebooted and the temp was updated to the current temp. But that number has not changed since, even after a reboot. Doh! That’s the problem then. I am using an iPhone4 with iOS4.2. Thank you for the reply! Are there any plans to get this working? I see that you used php to create a cache file, i’m trying to do the same thing as u did, using ur code as reference, but I can’t seem to make it work, any instructions needed to make it work? Hi, you should set the permission of the cache file to 666 to write data into it. Ah yes, actually, it’s already set to 777. btw, I am trying this on iOS4.1, I’ve read above it’s not really compatible with iOS4? But it seems it was able to update the weather.cache (not always, but it does) . It appears to always return code 4 for the readystatechange of the XMLHttpRequest, any ideas? Thanks! Are you using Cydget for iOS4? Cydget is buggy on iOS4 and I have no idea about it. I don’t have any background behind, it’s just black, what’s wrong? Are you using iOS4? It doesn’t support iOS4 currently. Ah yes, it might be the engine, I tried running the scripts on the same environment yours was running and it worked, thanks! using Cydget for IOS4, everything works except no background. any suggestion? There’s no way to get original size background image in iOS4, most of themes use thumb image but I think it’s no good. If you want background you could modify html and add background yourself. How do You change the wallpaper easily ? I cant find the appropriate setting when I SSH ..
Make sure you have enter the right city code. It doesn't work on 5.1.1 (no figures on the clock), though is so desirable. Any plans to make it compatible? Cydget isn't support iOS5, I can't do anything of that.